It is normal for new ninja warrior athletes to tear the skin on their hands from doing obstacles. That is why our first step is to explain why calluses are crucially important. Not having calluses or having calluses which are too thick, can lead to the same problem – tears. Hand tears can be painful and temporarily slow down training. 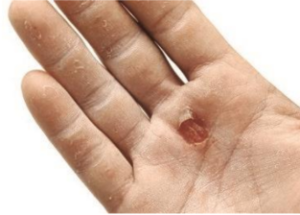 If you are new to obstacle training, your calluses are most likely lacking. It may take up to three months for your skin to fully acclimate to the new demand. The first three months of training should be taken slowly. The key is to limit training time and weekly frequency until your hands are fully adjusted. We recommend training 1-2 times per week for roughly three months before increasing weekly frequency. Some hand discomfort, such as general palm tenderness, is to be expected when engaging in grip training. The discomfort will decrease with time and conditioning. Focus on your goals and don’t let temporary hand pain dictate your success. Any new sport requires adaptation. If you have established calluses, it’s now time to control their thickness. If you don’t, you will likely tear much deeper than if you had none. If your calluses are too thick, the skin creates a substantial hard mound. In a hanging position, that mound becomes trapped, and when the hand stretches enough from an active motion, the weaker surrounding skin tears. You can identify your palm callus “mound” size by hanging on a bar statically for about one minute. After hanging, the callus mound will become peaked. There are some simple procedures to keep calluses at optimal thickness without much hassle. The key is to use a tool that allows you to remove small layers of the callus. Focus on consistent efforts rather than aggressively banishing those calluses. Use daily. 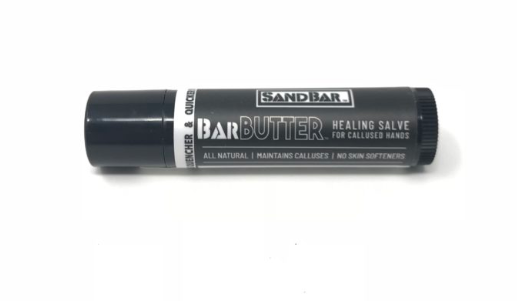 We highly recommend the SandBar for callus control. It prevents excess callus buildup without stripping down the necessary layers. Use daily and during training. A recommended practice for those with or without substantial calluses is to use hand cream/balm soon after a training session is complete and on rest days. Hydrated skin will repair quicker and stronger. We sell high-quality SandBar salve made just for climbing activities. Follow the instructions on the container. Anyone can train hard and it is tempting to ignore signs of skin fatigue. However, elite ninja warriors know how to consistently prevent tears and therefore effectively train harder and more frequently. Prevention is the ninja method. What happens if you do tear? The first thing you should do is stop! Don’t continue to damage the skin and spread blood on equipment. It is tempting to push on while bleeding, but you should discontinue ninja training until you have recovered (3-5 days depending on the depth of the tear). The key to a speedy recovery is moisture. Use triple-antibiotic cream in addition to SandBar Salve. When you are home and the bleeding has slowed/stopped, you should trim excess skin ledges/flaps. This will prevent future tears by creating seamless and smooth skin. You can use a sanitized cuticle clipper or surgical scissors. Do not pull the skin! It will worsen the rip.